Opened in 1970, the World Trade Center was constructed by the Port Authority of New York and New Jersey. 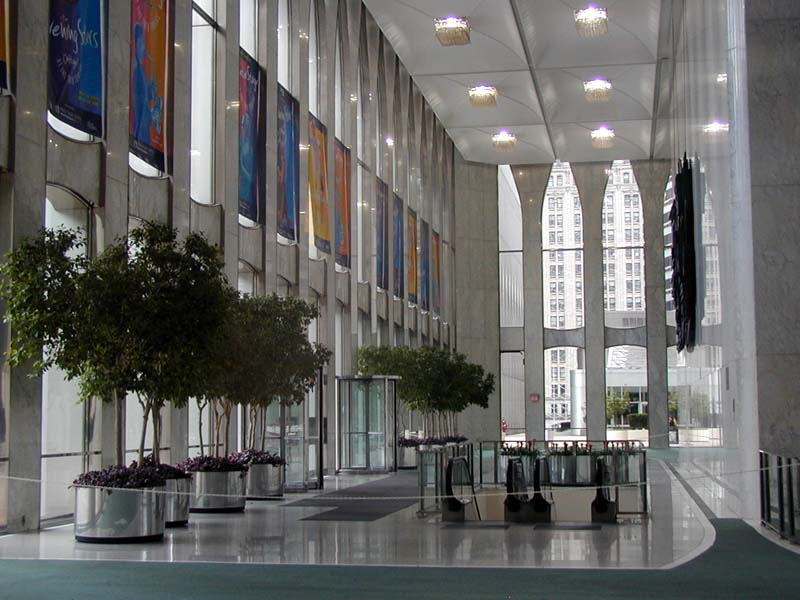 It was designed by architect Minoru Yamasaki. 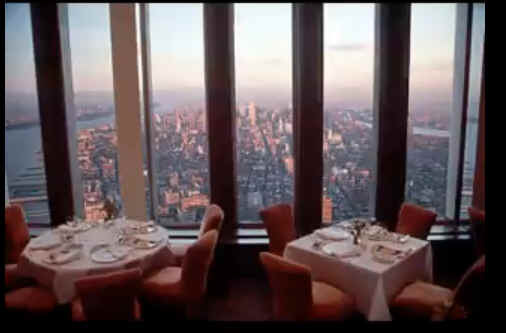 One World Trade Center featured Windows on the World, an elegant restaurant with a magnificent view of New York City. Two World Trade Center featured two observation decks, both more than 1,300 feet above the city. Each tower had 104 passenger elevators, 21,800 windows, and roughly an acre of space on each floor. From the observation deck on Two World Trade Center it was possible to see 45 miles in every direction. Each tower swayed approximately three feet from true center in strong wind storms. If all the glass used in the construction of both towers were melted into a ribbon of glass, 20 inches wide, it would run 65 miles long. There were four major structural subsystems in the towers, referred to as the exterior wall, the core, the floor system, and the hat truss. The first, the exterior structural subsystem, was a vertical square tube that consisted of 236 narrow columns, 59 on each face from the 10th floor to the 107th floor . There were also columns on alternate stories at each of the beveled corners, but these carried none of the gravity loads. (There were fewer, wider-spaced columns below the 7th floor to accommodate doorways.) Each column was fabricated by welding four steel plates to form a tall box, nominally 14 in. on a side. The space between the steel columns was 26 in., with a narrower,framed plate glass window in each gap. Adjacent columns were connected at each floor by steel spandrel plates, 52 in. high. The upper parts of the buildings had less wind load and building mass to support. Thus, on higher floors, the thickness of the steel plates making up the columns decreased, becoming as thin as ¼ in. near the top. There were 10 grades of steel used for the columns and spandrels, with yield strengths ranging from 36 ksi to 100 ksi. The grade of steel used in each location was dictated by the calculated stresses due to the gravity and wind loads. All the exterior columns and spandrels were prefabricated into welded panels, three stories tall and three columns wide. The panels, each numbered to identify its location in the tower, were then bolted to adjacent units to form the walls . The use of identically shaped prefabricated elements was itself an innovation that enabled rapid construction. The high degree of modularization and prefabrication used in the construction of these buildings and the identification, tracking, and logistics necessary to ensure that each piece was positioned correctly was unprecedented. A second structural subsystem was located in a central service area, or core, approximately 135 ft by 87 ft, that extended virtually the full height of the building. The long axis of the core in WTC 1 was oriented in the east-west direction, while the long axis of the core in WTC 2 was oriented in the north-south direction The 47 columns in this rectangular space were fabricated using primarily 36 ksi and 42 ksi steels and also decreased in size at the higher stories. The four massive corner columns bore nearly one-fifth of the total gravity load on the core columns. The core columns were interconnected by a grid of conventional steel beams to support the core floors. Note: Column numbers are shown around the perimeter. 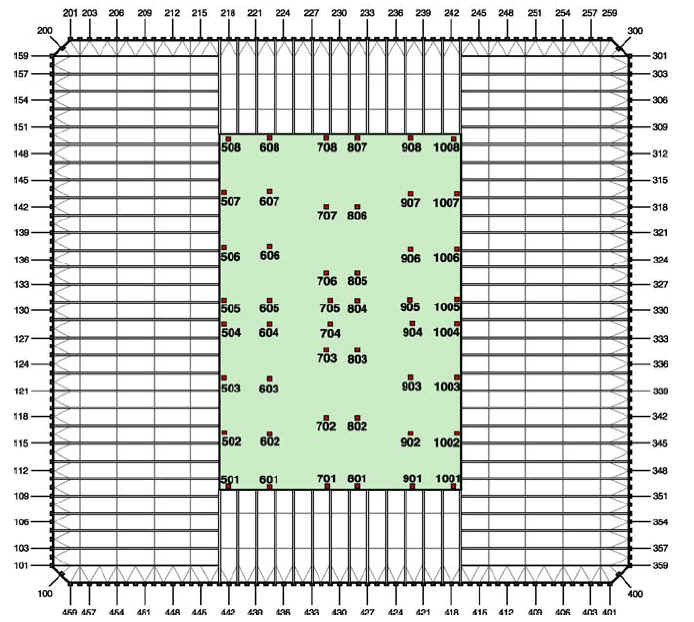 The four corner core columns (501, 508, 1001, and 1008) are marked for orientation. Stairwells A, B, and C are shown in red stripes. 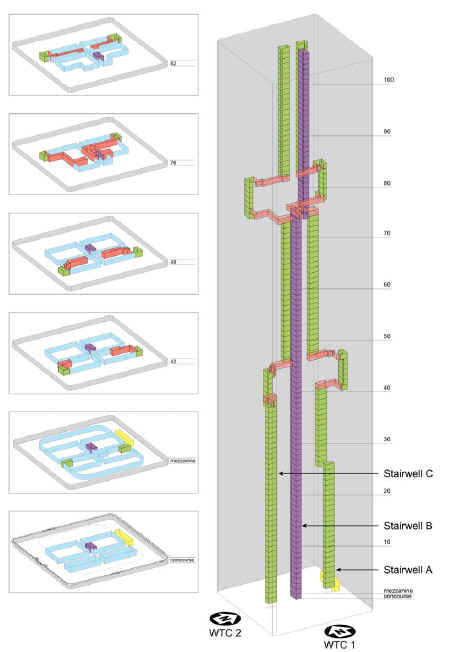 The fourth red-striped area is the tenant's convenience stairwell that connected the 95th through 97th floors in WTC 1; it was not considered part of the egress system. The remaining numbers denote specific elevators. Much of the rest of the floor was open space suited for offices, conference rooms, or office cubicles. The arrangement and size of the core varied among the different floors. The third major structural subsystem was the floors in the tenant spaces. These floors supported their own weight, along with live loads, provided lateral stability to the exterior walls, and distributed wind loads among the exterior walls. The floor construction was an innovation for a tall building. 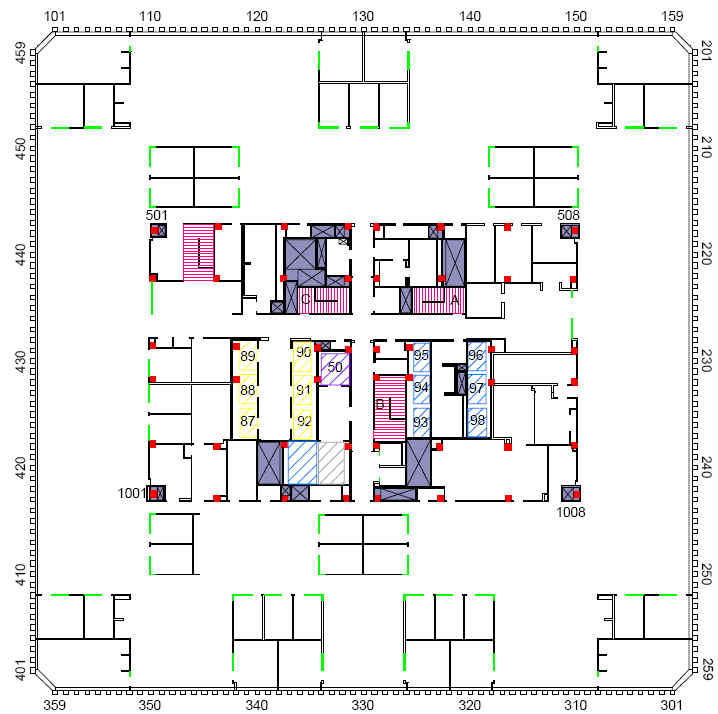 As shown in Figure 1–6, each tenant floor consisted of 4 in. thick, lightweight cast-in-place concrete on a fluted steel deck, but that is where "ordinary" ended. Supporting the slab was a grid of lightweight steel bar trusses. The top bends (or “knuckles”) of the main truss webs extended 3 in. above the top chord and were embedded into the concrete floor slab. This concrete and steel assembly thus functioned as a composite unit, that is, the concrete slab acted integrally with the steel trusses to carry bending loads. The primary truss pairs were either 60 ft or 35 ft long and were spaced at 6 ft 8 in. There were perpendicular bridging trusses every 13 ft 4 in. The floor trusses and fluted metal deck were prefabricated in panels that were typically 20 ft wide and that were hoisted into position in a fashion similar to the exterior wall panels. The bottom chords were connected to the spandrel plates by devices that were called viscoelastic dampers. Experiments on motion perception, conducted with human subjects, had shown a high potential for occupant discomfort when the building swayed in a strong wind. When the tower was buffeted by strong winds, these dampers absorbed energy, reducing the sway and the vibration expected from a building that tall. The use of such vibration damping devices in buildings was an innovation at that time. The fourth major structural subsystem was located from the 107th floor to the roof of each tower. It was a set of steel braces, collectively referred to as the “hat truss” (Figure 1–7). 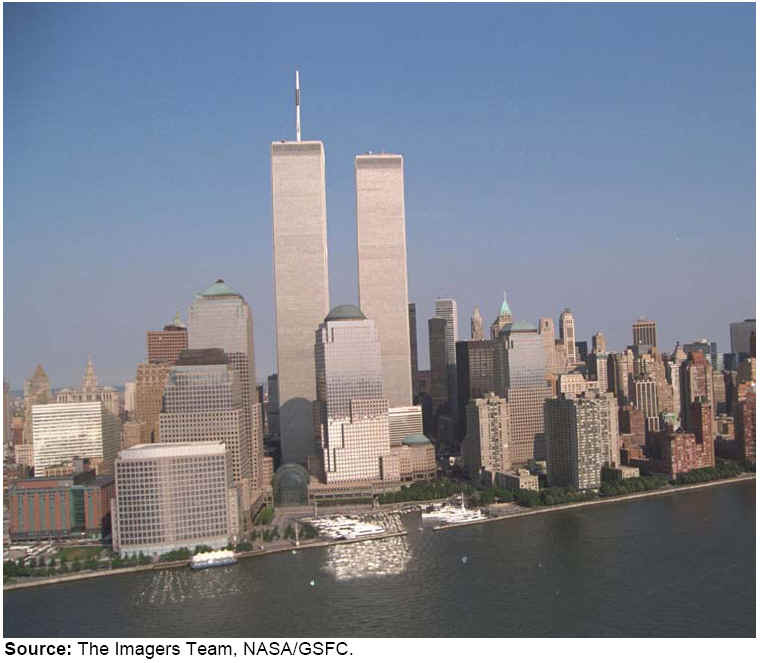 Its primary purpose had been to support a tall antenna atop each tower, although only WTC 1 had one installed. 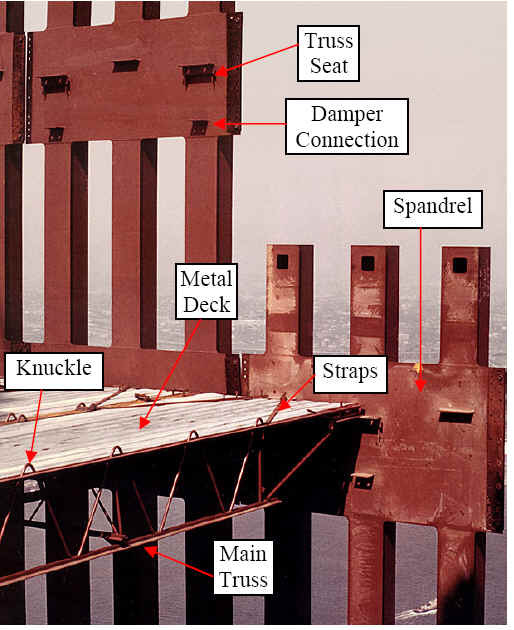 The hat truss provided additional connections among the core columns and between the core and perimeter columns, providing additional means for load redistribution. At the beginning of the workday, many of the roughly 50,000 people who worked in the towers and visited to conduct business or to tour emerged from trains in the massive subterranean station. They would take escalators and elevators to a one-story shopping mall, then pass through revolving doors to enter a spacious, 6-story-high lobby on the Concourse Level. There, they would cross paths with those who arrived on foot or by bus or cab. Getting tens of thousands of people from the Concourse to their offices was no small task. This was accomplished by a combination of express and local elevators located within each of the building cores that was novel at the time of construction. • People traveling to floors 9 through 40 entered a bank of 24 local elevators at the Concourse Level. These were divided into four groups, with each stopping at a different set of eight or nine floors (9 through 16, 17 through 24, 25 through 31, and 32 through 40). • Those going to floors 44 through 74 took one of eight express elevators to the 44th floor skylobby before transferring to one of 24 local elevators. These 24 were stacked on top of the lower bank of 24, providing additional transport without increasing the floor space occupied by the elevators. • Those going to floors 78 through 107 took one of 11 express elevators from the Concourse Level to the 78th floor before transferring to one of 24 local elevators. These were also stacked on the lower banks of 24 local elevators. To provide the desired high rate of people movement, this three-tier system used roughly 25 percent less of the building footprint than the conventional systems in which all elevators ran from the Concourse to the top of the building, resulting in a building core that took up as much as one-half of the floor area. In addition, there was even more rentable space to be gained. At the top of each elevator bank, the machinery to lift the cabs occupied one additional floor. From the next floor up to the bottom of the next bank, there was no need for an elevator shaft. The concrete floor was extended into this space, providing additional rentable floor area. There were two additional express elevators to the Windows on the World restaurant (and related conference rooms and banquet facilities) in WTC 1 and to the observation deck in WTC 2. There were also five local elevators: three that brought people from the subterranean levels to the lobby, one that ran between floors 106 and 110, and one that ran between floors 43 and 44 (in WTC 1), serving the cafeteria from the skylobby. There were also eight freight elevators, one of which served all floors. All elevators had been upgraded to incorporate firefighter emergency operation requirements. The complex was situated on a 16-acre site and consists of seven buildings with 12 million square feet. All were constructed around the five-acre Austin J. Tobin Plaza and have entrances to the Plaza and the surrounding city streets. 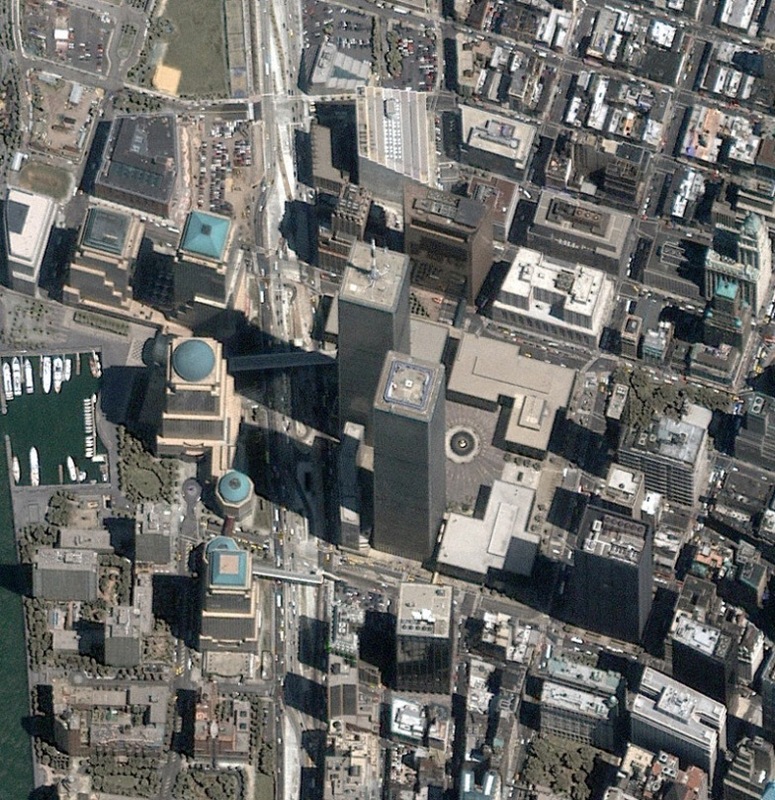 The World Trade Center was connected by a land bridge to the World Financial Center complex located to its west and is close to the New York and American Stock Exchanges. More than 400 firms from 25 countries were represented in the complex. 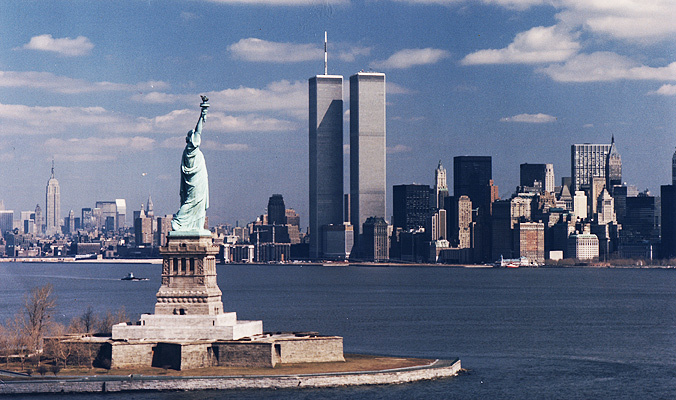 At least 50,000 people worked at the World Trade Center and another 70,000 visited each day. The Center consisted of two 110-story (1350 feet each) office towers (One and Two World Trade Center), a 47-story office building (Seven World Trade Center), two nine-story office buildings (Four and Five World Trade Center), an eight-story U.S. Customhouse (Six World Trade Center), and the 22-story New York Marriott World Trade Center Hotel (Three World Trade Center). At 110 floors, The World Trade Center was New York's tallest building and the among tallest buildings in the world. Windows on the World was a complex of venues at the top floors (106th and 107th) of the North Tower of the World Trade Center in Lower Manhattan that included a restaurant, Windows on the World, a smaller restaurant called Wild Blue, and a bar called The Greatest Bar on Earth, as well as rooms for private functions. The Marriott World Trade Center was a 22-story steel-framed hotel building with 825 rooms. 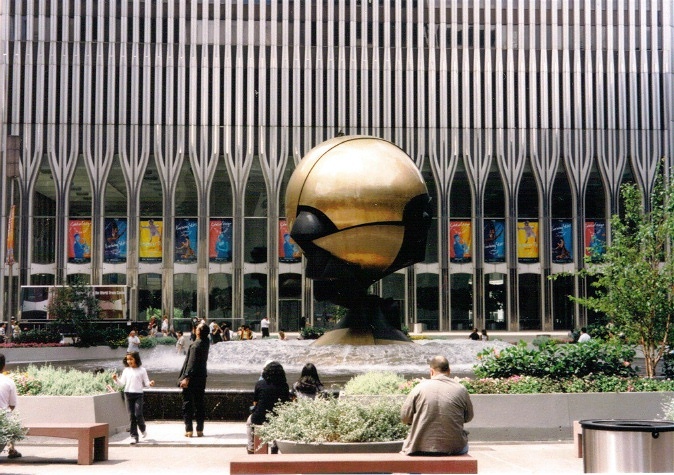 It opened in 1981 as the Vista International and was located at 3 World Trade Center in New York City. Vista was the brand name under which Hilton International operated hotels in the United States during the period when they were a separate company from Hilton Hotels. The Vista Hotel was the first hotel to open in Lower Manhattan since 1836. The building was designed by Skidmore, Owings & Merrill and originally owned by the Port Authority of New York and New Jersey. It was sold in 1995 to Host Marriott Corporation after then-Governors George Pataki of New York and Christine Todd Whitman of New Jersey pressured Port Authority officials to sell its less profitable assets. 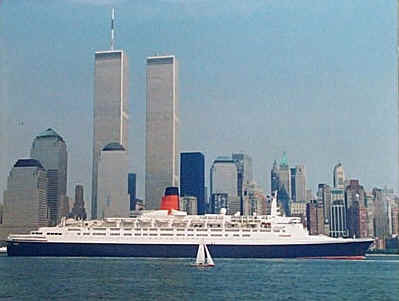 The hotel was connected to the North and South tower, and many went through the hotel to get to the Twin Towers. The hotel had a few establishments including Greenhouse Cafe, Tall Ships Bar & Grill, a store called Times Square Gifts, The Russia House Restaurant and a Grayline New York Tours Bus ticket counter, a gym and a hair salon named Olga's. The hotel also had 26,000 square feet (2,400 m2) of meeting space, and was considered a four-diamond hotel by AAA. The structure was destroyed on September 11, 2001 in the collapse of the north and south towers of the World Trade Center. 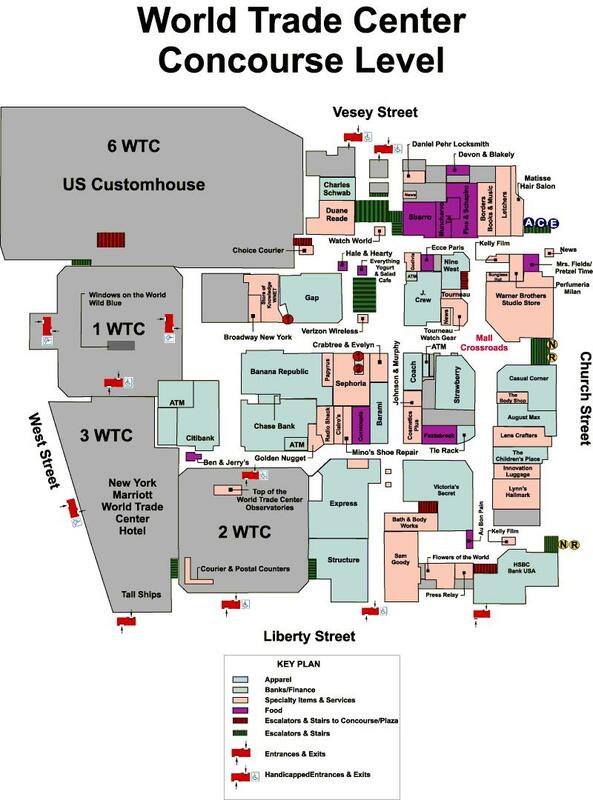 The government agencies housed at 7 World Trade Center were the United States Secret Service, the Department of Defense, the Immigration and Naturalization Service, the U.S. Securities and Exchange Commission (SEC), the Mayor's Office of Emergency Management, the Internal Revenue Service Regional Council (IRS), and the Central Intelligence Agency (CIA). Downtown Lower Manhattan Association is created by real estate developer David Rockefeller to revitalize lower Manhattan and begins to promote the idea of a "world trade and finance center" in New York City. David Rockefeller presents a plan for a world trade center along the East River of Manhattan. 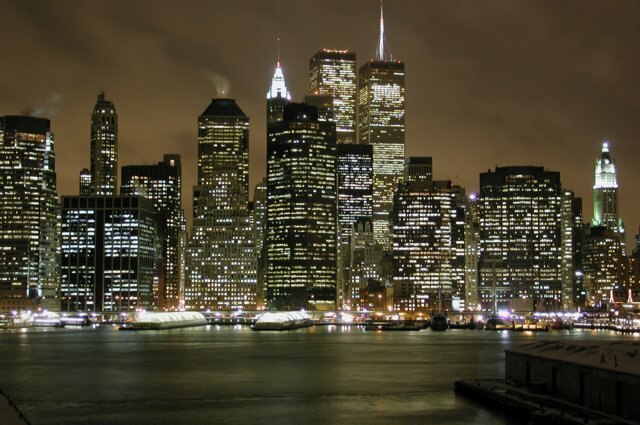 The Port of New York Authority is commissioned to study the plan. On March 10, Port Authority issues a favorable report on the feasibility of developing a world trade center. 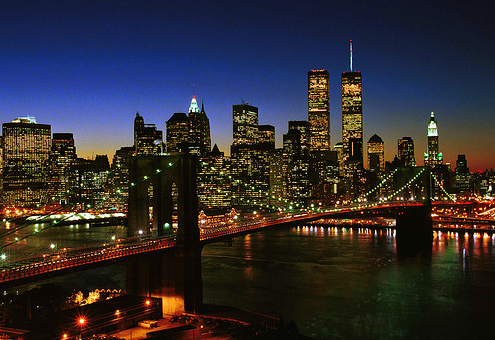 New York and New Jersey authorize the development of the World Trade Center. 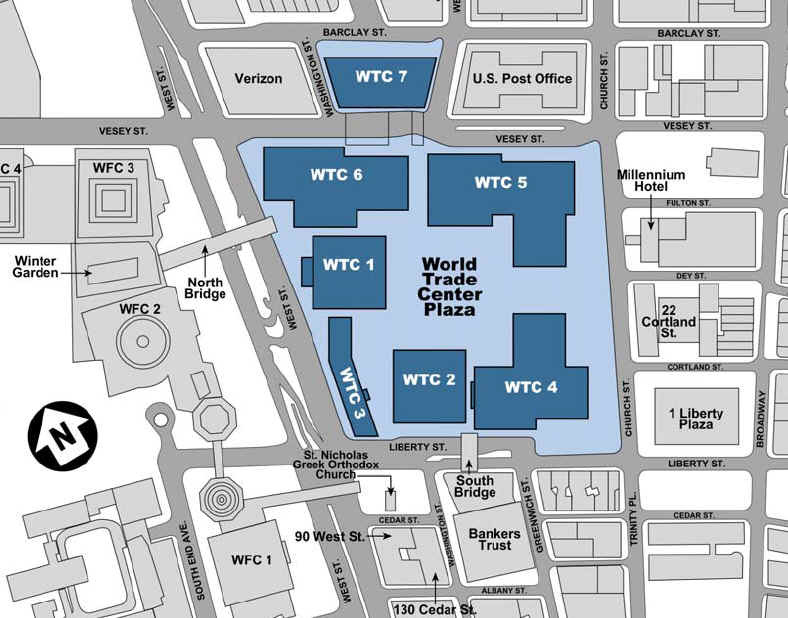 World Trade Center location moves to West Side amidst protests by displaced business owners. 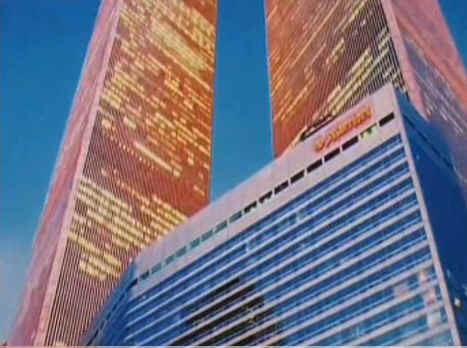 The Port Authority wins legal challenge to the development of the WTC. The Port Authority unveils an architectural plan for the WTC featuring the world’s tallest buildings. Construction begins on March 21 at the WTC site with the demolition of 78 Dey Street. Excavation work begins for the WTC. First use of "slurry wall" method in the United States. 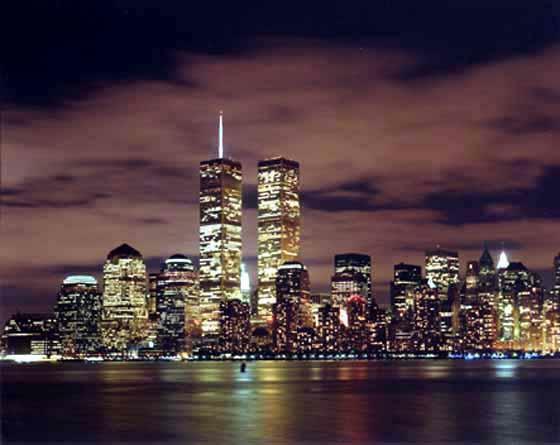 New York City Board of Estimates formally approves the WTC legislation. The North Tower of the WTC exceeds the height of Empire State Building, making it the tallest building in the world. The first tenants move into North Tower of the WTC on December 15. The North Tower of the WTC is topped off at 1,368 feet on December 23. The South Tower of the WTC is topped off at 1,362 feet on July 19. The first tenant moves into Two World Trade Center (South Tower). 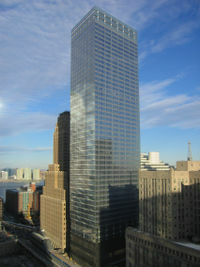 The first tenant moves into Five World Trade Center (Northeast Plaza Building). 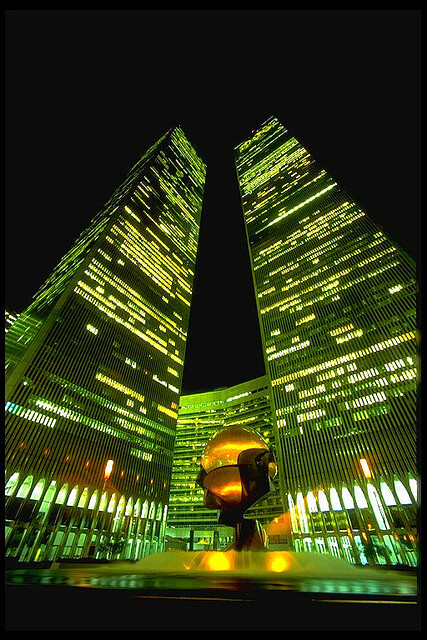 The World Trade Center is dedicated on April 4. U.S. Customs Service moves into Six World Trade Center. Tightrope artist Phillippe Petit performs an unauthorized walk between the Twin Towers on April 7. Top of the World Observation Deck opens at Two World Trade Center (South Tower). 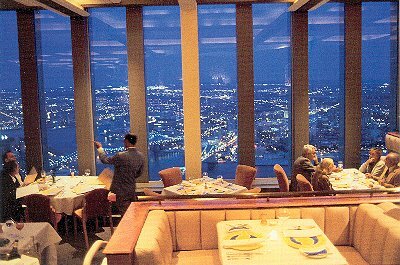 The Windows of the World Restaurant opens at the top of the North Tower on April 19. The first tenant moves into Four World Trade Center (The Commodities Exchange Center). The 360-foot antenna mast atop One World Trade Center is completed. The Vista International Hotel, the first hotel built in Lower Manhattan since 1836, opens. Seven World Trade Center opens. On February 26, terrorists detonate 1,500 pounds of explosives in a van parked in the underground public parking lot of the WTC, two levels below the southern wall of the North Tower. The attack kills six people, including a pregnant woman, injures more than 1,000 people and creates a five-story crater beneath the towers, resulting in hundreds of millions of dollars of damage. The WTC reopens for business on March 19, led by tenant New York Governor Mario Cuomo and his staff. The Port Authority implements a $250 million upgrade plan focusing on life safety and security. The WTC is designated one of the "Seven Wonders of the Modern World" by the American Society of Civil Engineers. 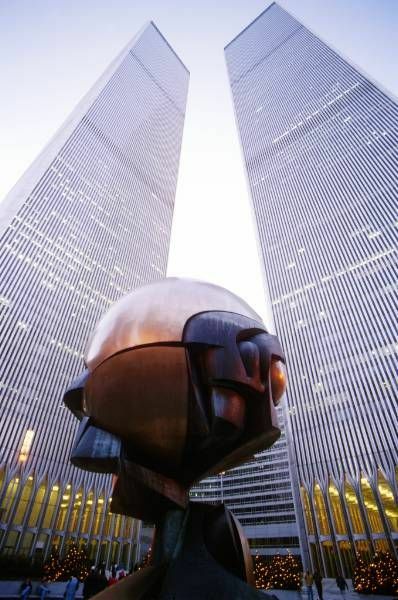 The WTC is visited by every U.S. president between the time of its opening and the time of its destruction at least once, as well as by many dignitaries and heads of state. A memorial fountain is dedicated in the WTC plaza to the victims of the 1993 bombing. The Vista International Hotel is sold and renamed the New York Marriott World Trade Center Hotel. On September 24, The Port Authority announces plans to seek a 99-year net lease of the complex. The WTC reaches its highest occupancy rate. The WTC is net-leased on July 24 to private developer Silverstein Properties, Inc. for approximately $3.2 billion. A three-to-six month transition period commences. 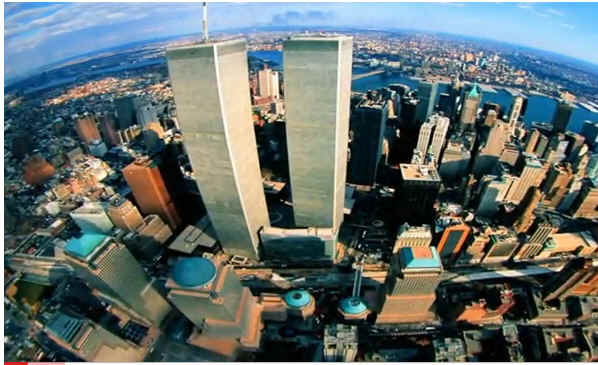 Two planes hijacked by terrorists crash into the Twin Towers, destroying the complex. One World Trade Center is struck at 8:46 a.m.; Two World Trade Center at 9:03 a.m..